Credit card breaches aren't new. 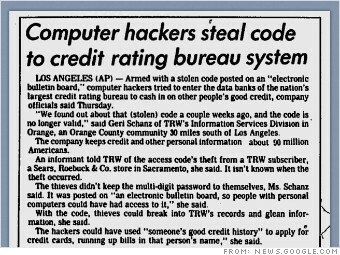 In 1984, someone stole a password to a file kept by credit-reporting company TRW Information Systems, which gave the thief access to the credit histories of 90 million people. According to The New York Times, the thief posted the file password on an "electronic bulletin board," or a "computer file accessible to subscribers by phone." (Oh, pre-Internet days.) Someone with access to the password could have combined that with information like a cardholder's name, address, etc., to obtain credit card numbers. An informant tipped off TRW that the password had been stolen from a Sears Roebuck (SHLD) store on the West Coast, and it could have been used illegally for up to a month.